Hi there!!! I've had this card made for awhile but I couldn't post it until after my stepdad's birthday. Okay, who are we kidding??? I made it the day of his birthday but forgot to post it. LOL!!! I'm bad, I know!!! 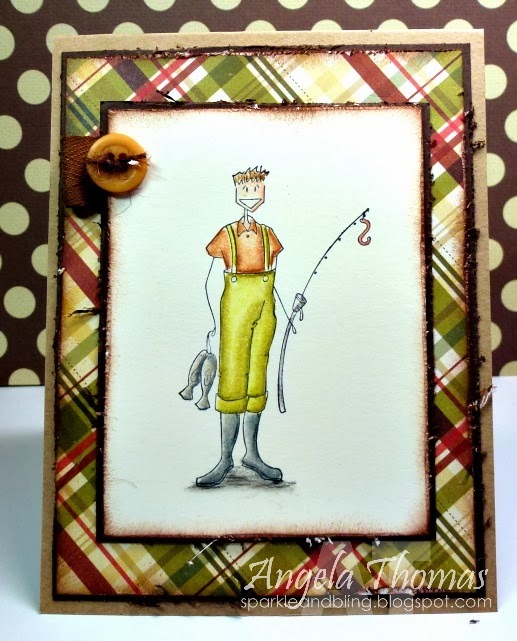 For my card, I used a recent Sweet Sunday sketch challenge because it was perfect for the image. 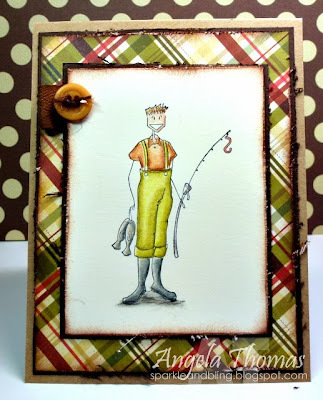 I've used "Fishafella" from Stamping Bella on my card which was stamped using Archival Black ink and then colored with Prismacolor Pencils and Gamsol. Believe it or not, I used some Simple Stories Christmas DP that I had left over from last year, perfect for a man's card!!! I distressed the edges of each of the panels and then sponged with Chocolate Chip Ink. I have one more card for the month so I'll see you Thursday!! Have a great day!